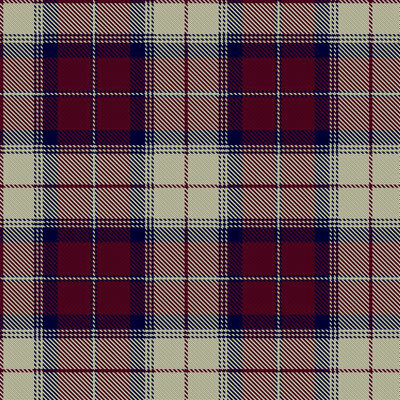 The Siddle Family Tartan design was commissioned in the year 2006. It was then designed and registered by Maxine Scott of the House of Tartan , Perthshire, in Scotland. The House of Tartan is a company that was established by Blair Urquhart an international textiles expert and lecturer on tartan design and history. The new tartan was commissioned as a reminder of the traditions of my mother’s side of the family. 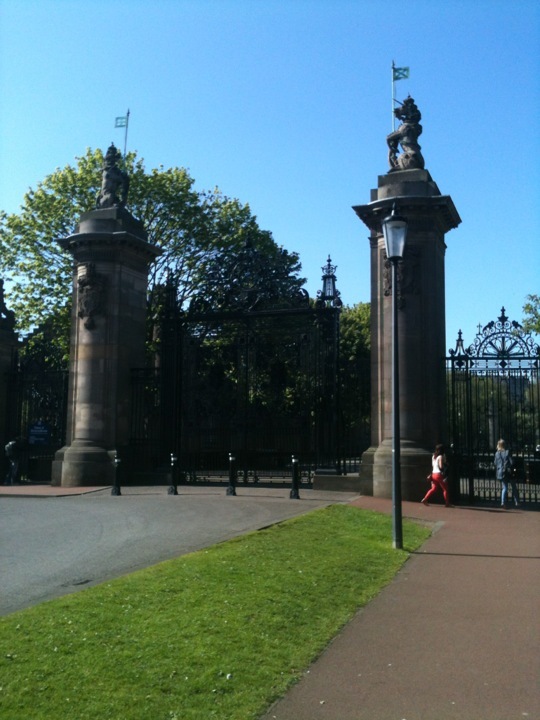 My mother’s father Henry Crawford was of the Lanarkshire Crawford line of lowland Scotland. His family moved down into northern England in the 1800‘s to take advantage of work opportunities in the coal mining industry. Henry ( alias Harry - died in 1966) became Managing Director of the Fell Coal Company and Marketing Director for Choppington Colliery. He basically ran teams of Shire Horses with carts to deliver coal door to door in north east England. Henry Crawford liked to keep with his family’s Scottish heritage traditions and used the Lindsay Dress Clan tartan for special events (Lindsay took over the Crawford Clan and became head clan to it back in history ) whilst still having relatives from our Scottish side of the family visiting him in northern England on special occasions. 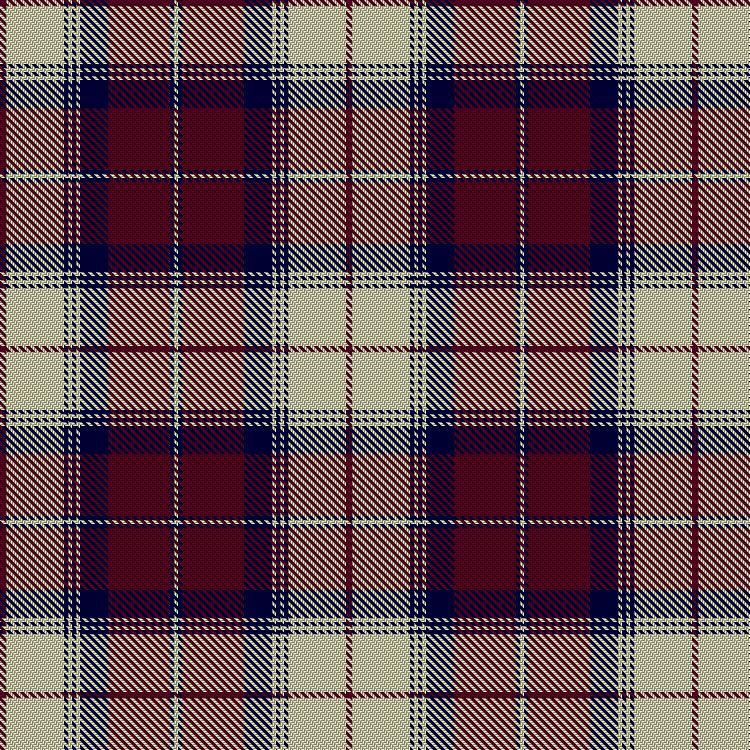 Basically Siddle Tartan is a redesign of Lindsay Dress Clan Tartan (red) ,which Henry Crawford used to use, to create a completely new Siddle Tartan . 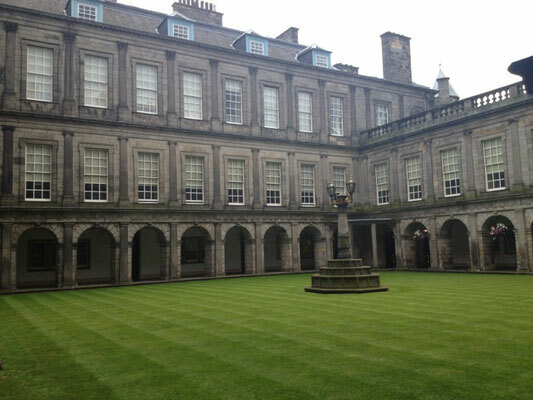 Back in the 1980's I used to visit Holyroodhouse Palace, in Scotland, while Queen Elizabeth the Queen Mother was residing there. May she rest in peace since her death on the 30th March 2002! 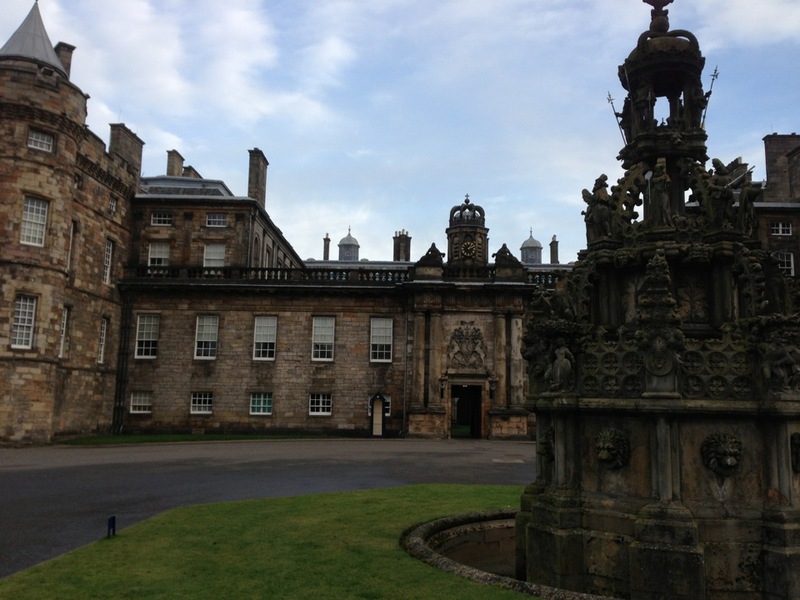 My visits were part of my Intelligence work operations and I was invited to visit Holyroodhouse Palace, in Scotland, by HRH Queen Elizabeth the Queen Mother (mother of Queen Elizabeth II). This was as an Armed Intelligence Emissary from Section 6 of the Military Intelligence services (1985 - 1992 with a final re call at the end of the 1990's or so), Vauxhall Cross, London.Following an incident in which a supposed security guard drew a commando knife I shot the man dead using a Beretta Revolver that I had in my suit jacket as part of my job. The Queen mother thereafter sent me several letters, and telephoned me, and always on the best possible terms. The shooting was in the press worldwide. As a UK state armed Intelligence agent I had 100% diplomatic immunity, from prosecution, to use firearms in defending the Queen mother or any other member of the Royal Family. Following this, and much later on, it made sense, to me, to restore a memory of the Scottish side of my family , as an example of our Great British heritage for the future. 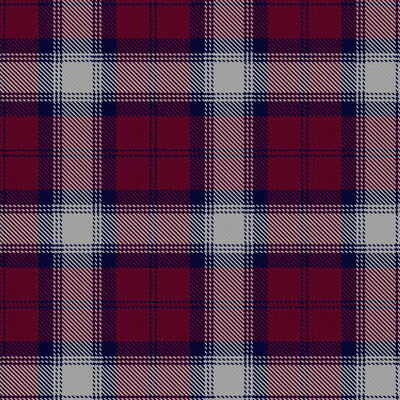 The restoration of this memory lies within the new tartan design created by Maxine Scott of Perthshire. 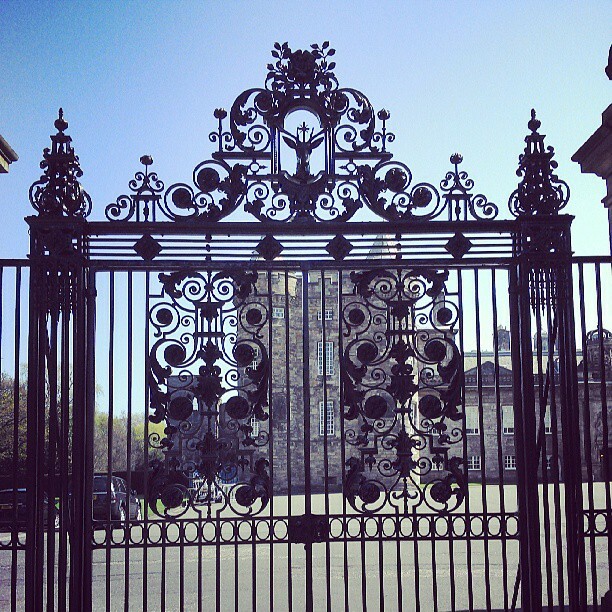 For quite some time I was offered a position doing security at the Holyroodhouse Palace permanently which I never accepted. HRH The Queen Mother kept saying " but do you really want to join that lot Andrew!? " while we chatted in the Palace grounds and she was right. I am more a free bird and she thought of me as more of a friend type than somebody who would serve the Palace. So I didn't do it! I visited the palace for security reasons, and as a friend, for a while and she corresponded with me by letter and telephone. When the arrangement ceased the press tried to say that I had been discredited and would not be allowed there again ever. The Queen Mother objected to this because every single word that they came out with was a complete and utter lie and not in anybody's interests. She sorted the situation out on my behalf to restore my name which she did. She was a very lonely little lady there all those years at Holyroodhouse Palace though. There are two sides to every family and my family likewise. The Siddle name comes from northern England and commences with the 6th century dark age saxon period when England was still called Albion Country. So our family are basically half lowland Scottish and half Albion period northern English in our Great British tradition. Restrictions: Yes. This tartan may be worn, or the weaving authorised, by anyone who is a relative or descendant of Sir Andrew David Siddle. Alternatively by anyone who bears the exact same spelling of the surname, for their personal use only (not for commercial gain or profit). 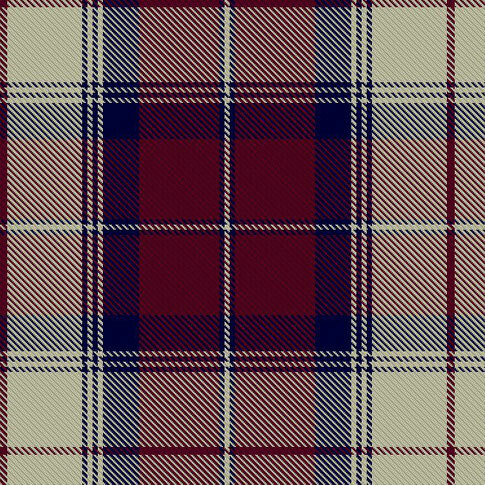 The Siddle tartan was designed in 2006 as a new family tartan. It was previously recorded as STWR ref.3253 and STA ref.6912. The Siddle family surname can be traced back to the Dark Ages in ancient Wessex but is nowadays associated with the North West and North East counties, having been pushed northwards during the Saxon period. 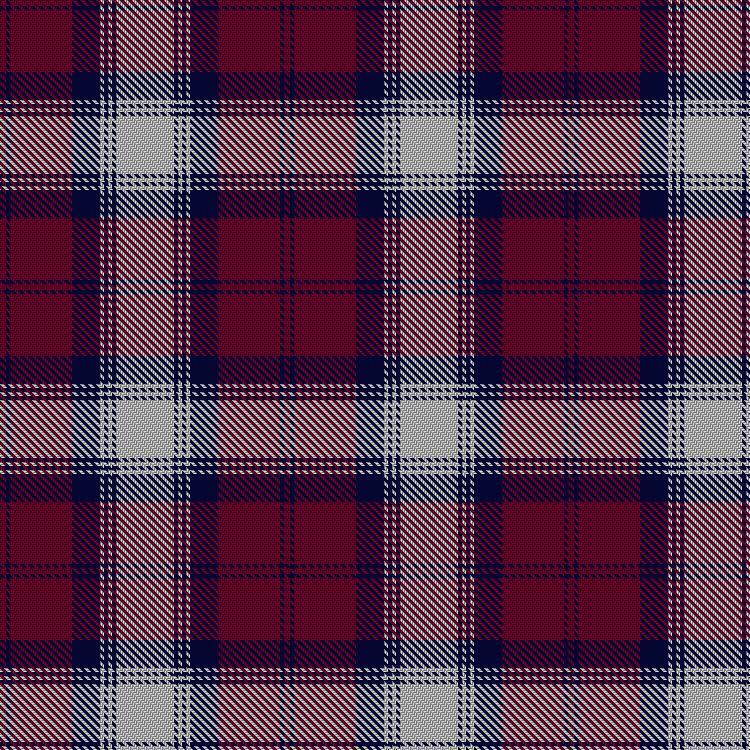 This tartan is for the particular branch of the Siddle family which is half Scottish through its connection to the Crawford Clan of Lanarkshire, through the owner’s mother's father, Henry (nickname Harry) Crawford, whose family moved into England in the 1800s. The Crawford Clan is associated with the Lindsay Clan. The owner’s grandfather therefore wore the Lindsay Dress Clan tartan which has been adapted to provide a new tartan for the Siddle family. On the left , below, is a picture of Lindsay Dress Tartan design. "Dress Clan Tartan" means for special purposes such as dances , dinner invites, marriages , births,etc. In other words special dress events. To the right of this is the new tartan design created by Maxine Scott of the House of Tartan in Perthshire. The instruction to her was to create a tartan that still displayed the hallmarks of the original Lindsay design when seen from a distance. 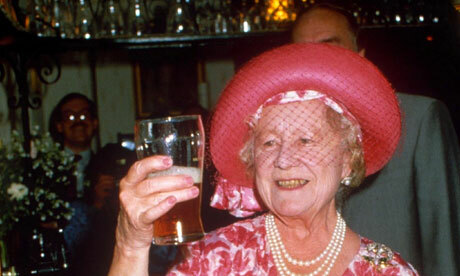 Photo of the Queen Mother (Mother to Queen Elizabeth II) thoroughly enjoying an official engagement at a local hostelry. The Queen Mother, widow of King George VI, at an official visit as part of her job. Scotland's political leaders have paid tribute to the Queen Mother in the Scottish Parliament. First Minister Jack McConnell led the tributes at a special sitting held to mark her passing. Mr McConnell told MSPs: "She had Scotland in her heart, and Scots everywhere will retain a place in their hearts for Her Majesty Queen Elizabeth, the Queen Mother. "For her life of dedication to duty, her service to others and for the way she loved life itself, we today give thanks." 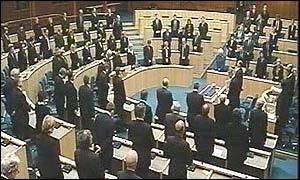 It is the first time that the parliament has been recalled during a recess since the death of Donald Dewar, the former first minister. 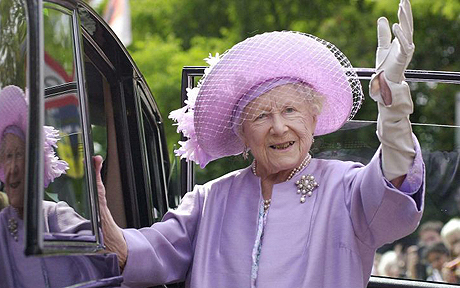 The House of Commons and House of Lords were also recalled from their Easter break on Wednesday so MPs and peers could pay their tributes to the Queen Mother. The Scottish Parliament's Presiding Officer Sir David Steel, who had returned from holiday in France, began the special sitting with an address. He described the Queen Mother as a "great daughter of Scotland". His opening remarks were followed by a minute's silence. The session was short, formal and sombre. Many of the MSPs wore black or dark colours in a mark of respect. It is thought that 46 MSPs did not attend the sitting. No formal count was taken as there was no vote, but parliament officials estimated that 83 of the parliament's 129 MSPs were present, as well as the two law officers. Below are photographs of the ruins of Holyrood Abbey , Edinburgh, dedicated and built in tribute to Sir Gregan Crawford, who saved King David's life in Scotland. First founded in the year 1128 ACE by King David I. Early Photograph of Henry Crawford, and family, who is the inspiration for the new Siddle Tartan Design of Perthshire, Scotland, UK. These are photographs of my deceased grandfather Henry Crawford, on my mother's family side, who died in 1966. He lived in the coastal town of Redcar in County Cleveland, UK. 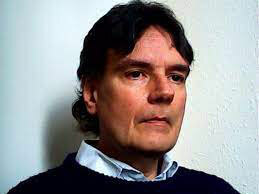 He was a coal mining industry marketing director of Choppington Colliery in north East England. Also the Managing Director of the Fell coal company who delivered coal around north east England by shire horse and cart directly to the home. His family were the traditional Crawford line of Scotland who came from Lanarkshire. Before the early part of the 1800's the family of my grand father Henry Crawford still lived in Lanarkshire, Scotland, where the traditional Scottish family historic seat is. The first photograph is of my grandfather Henry Crawford , and my mother Jean Crawford ( AKA Siddle). 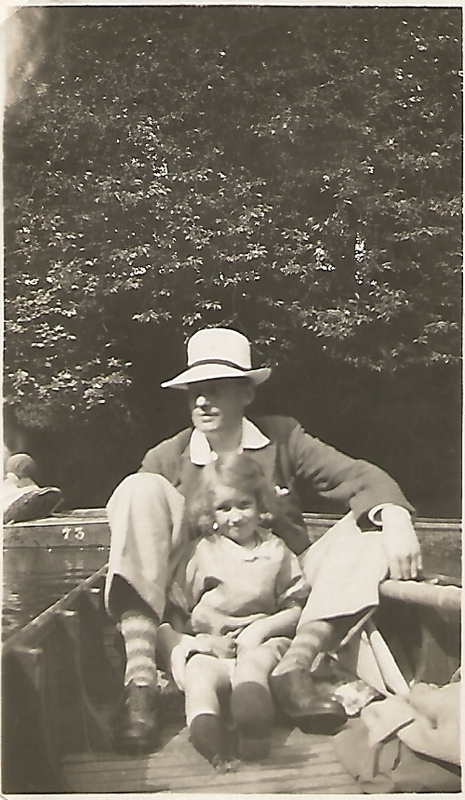 This was on a visit to Knaresborough and the punt they are in is on the river. 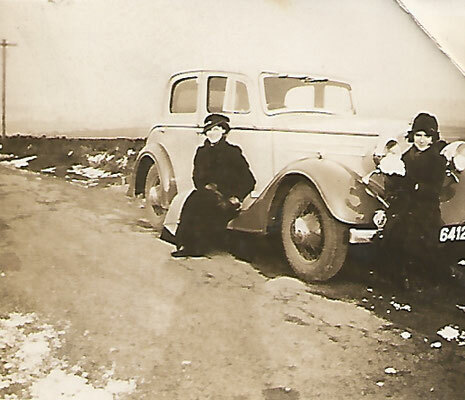 The second photograph is of my grandmother Linda Crawford and my mother Jean Crawford ( AKA Siddle) out in the North Yorkshire Moors during winter. 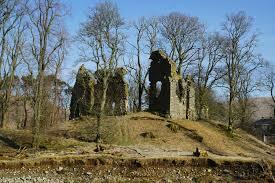 Photo of Crawford Castle , Lanarkshire, Scotland. Crawford Castle, substantially in ruins, is located on the north bank of the River Clyde, around half a mile north of Crawford, South Lanarkshire, Scotland. The ruins stand on an earlier motte and bailey earthwork. The castle was formerly known as Lindsay Tower, after its former owners, the Lindsay family. The strategic location of the castle, at NS954213, guards the approach from England into the upper Clyde Valley. The Lindsay family inherited half of the Barony of Crawford, known as Crawford Parish, via a marriage in 1215 to the younger daughter of Sir John Crawford, who died in 1246 without male issue. (Sir John's elder daughter Margaret married a Douglas scion.) The Crawford family retained the other half, known as Crawfordjohn Parish, as the Barony had been divided among the Crawford family four generations earlier. Crawford Castle is located in Crawford Parish. From an early date, the Clan Carmichael of Meadowflat acted as hereditary constables of the castle, retaining this post under successive owners. 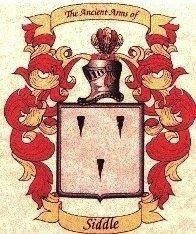 Clan Crawford (Crauford) have no head of clan that would be recognised by the Lord Lyon for Scotland any more. The last internally recognised Clan chief was Hugh Ronald George Craufurd, who sold his land (Auchenames, Crosbie and other estates) and moved to Canada in 1904. He died in Calgary, Canada, in 1942, leaving no male heirs. Originally , back in time, the youngest son of the 4th Earl of Richmond (who was descended from the Duke of Brittany) was granted lands in the Barony of Craufurd , or Crawford, in Lanarkshire in the 12th century by King David I , of Scotland. The family then took the surname from the place name. In 1127 Sir Gregan Crawford was involved in the legendary incident when King David was saved from being mauled to death by a stag (and King David founded the Abbey of Holyrood as a result in tribute to Sir Gregan). 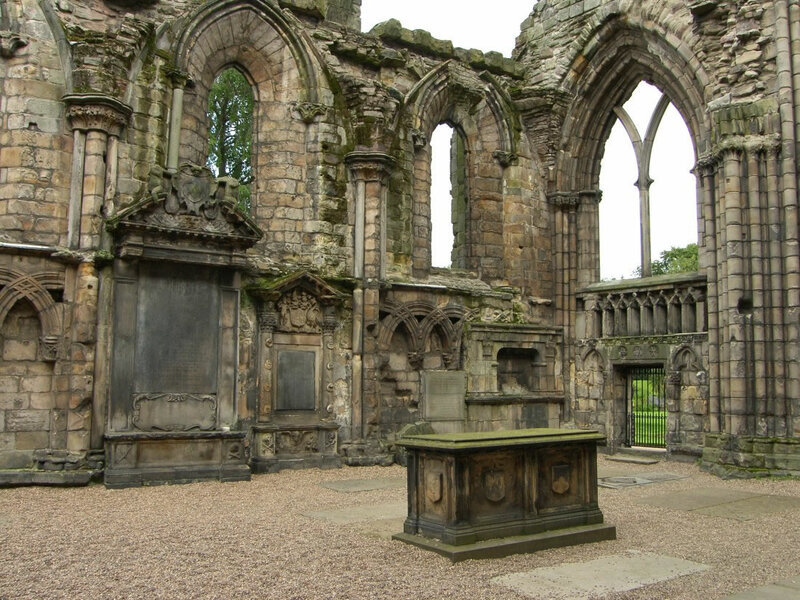 Because King David I was grateful for the saving of his life he commissioned the building of Holyrood Abbey in tribute to Sir Gregan Crawford. 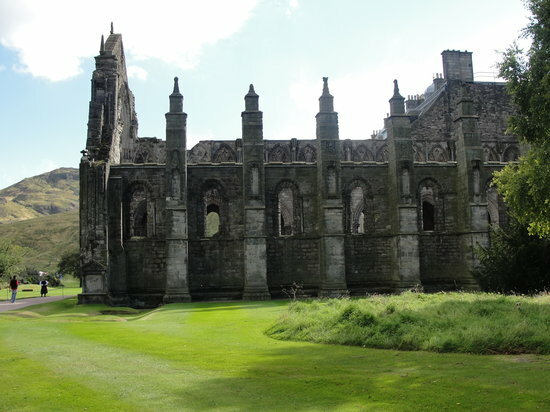 The ruined remnants of Holyrood Abbey still exist , in Edinburgh, next to Holyroodhouse Palace which was built much later on. 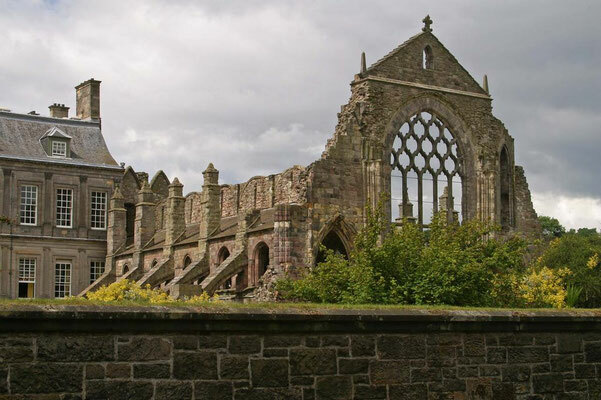 It seems very apt to me that Holyrood Abbey is the place where one of my very distant ascendants , on my mother's Lanarkshire Crawford side of the family, once defended King David 1 of Scotland from a fatal mauling by a stag. 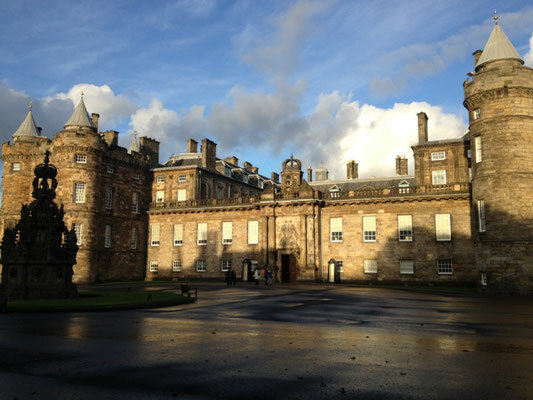 Holyroodhouse Palace, next to the Abbey, is also where I caught a supposed security man trying to draw a sharpened commando knife in the presence of HRH the Queen Mother (widowed wife of King George VI). I shot him dead in the presence of the Queen Mother to prevent him from taking further action with his commando knife. The title Earl of Crawford is one of the most ancient extant titles in Great Britain, having been created in the Peerage of Scotland for Sir David Lindsay in 1398. It is the premier earldom recorded on the Union Roll. The title has a very complex history. Crawford Castle, along with the title of Earl of Crawford, was given by Robert II to David Lindsay, 1st Earl of Crawford.